The museum at the Military Historical Institute of Prague in Czech Republic has got a great many unique and experimental firearms, both of indigenous and foreign origin. 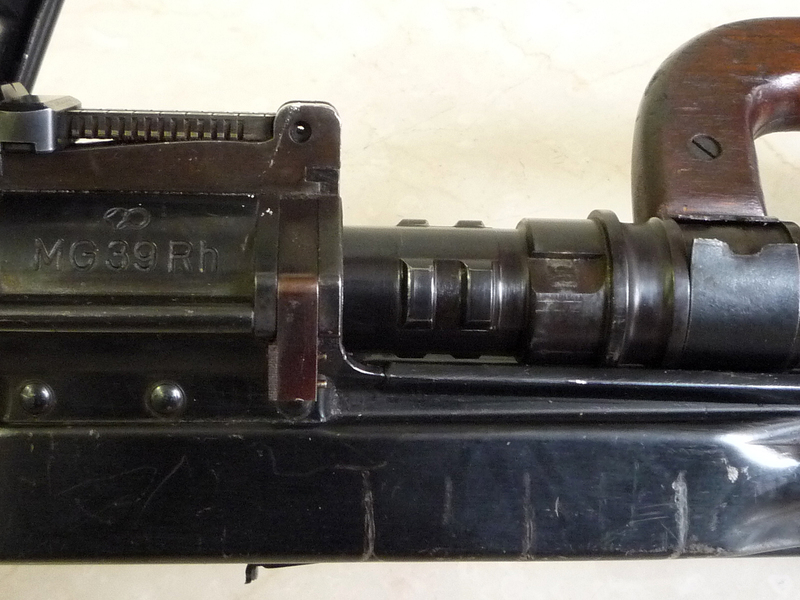 But even amongst these unique guns one can sometimes find a gem – such as this gas-operated, belt-fed general purpose machine gun (GPMG) neatly marked “MG 39 Rh” on the side. For years it was listed as lost forever during the war, and known only to a chosen few of those diligent enough to read footnotes in the 1937 machine gun contest files. But even though Nazi German weapons, especially the automatic ones, are still amongst the world’s hottest and favorite topics for researchers and collectors alike, this machine gun, even though as of 1962 no longer confined to the classified military small-arms research institute, still had no fitting description in books or otherwise outside Bohemia. This is not to mean that it was thoroughly researched in Bohemia, either: but at least there was an article describing it, published in the sadly late ‘Strelecki Magazin’ shooting monthly in the year 2002. The German military of the 1920s and 1930s was irrationally prejudiced against drilling bores – gas-operated automatic firearms were a major no-no. Up until the time of introduction of the G.43 rifle, German military scientists and technicians held that drilling bore would obligatory and unfavorably influence the internal ballistics of the gun, ruining accuracy and service life through erosion and corrosion. It took a major generation change in the Germany’s firearm’s industry’s main client, the re-born German Wehrmacht, to tumble down the walls of prejudice. 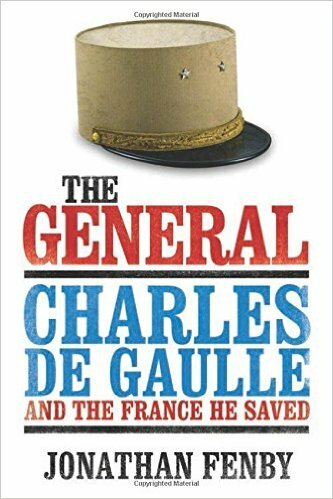 The older generals, dyed-in-the-wool theoreticians, were now phased out by young practitioners, who all-too-well remembered from their own first-hand experience on the wrong side of the muzzle, that the French gas-operated air-cooled Hotchkiss machine guns were every bit as deadly, accurate and dependable as the German recoil-operated water-cooled Maxims. It was not earlier that Hitler gained power and renounced Versailles Treaty in March 1935, that the Wehrmacht was re-born and these young lions could seize power in the rapidly growing organization. It was only then, and still with great deal of trouble, that the gas-operated automatics started to compete for the major military contracts. There still was a long and bouncy way ahead of them – as attested by the ordeal of the G.41. It was the first ever gas-operated gun to enter Wehrmacht armament – but alas the military forced upon the Mauser company that even though it was gas-operated, there dared not be any openings drilled in the bore, and the gases were vented from the muzzle, using the Bang principle which unreasonably complicated the already not entirely straight forward mechanism. That the military went against bore-drilling, doesn’t necessarily mean that all German gun industry was equally prejudiced and obsolete. Quite to the contrary – for each Wehrmacht contest gas-operated guns were proposed, but lack of financing, combined with subsequent lack of experience with such designs and the proverbial German prowess at ingeniously solving the self-invented problems meant that none of these were granted a fighting chance of getting through the obstacles cast in their way by the military. 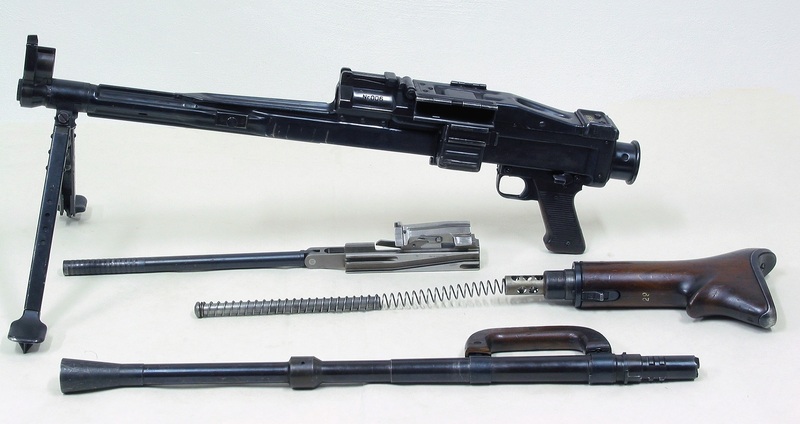 Walther got nearest to designing a practicable gas-operated semiautomatic rifle in their A.115 – but their gas-openings were not only twin (the gas was bleed to a sleeve around barrel with a donut-shaped piston) but way too large (in excess of 3 mm! ), as if to make a point that bore drilling would do no good. Then Vollmer designed the A.35, world’s first gas-operated intermediate-cartridge assault rifle – but then put a so much complicated clockwork inside, that it would have been unreasonable of the military board of review to ever green-light it into mass-production. Against that background, the Rheinmetall gas-operated machine gun seemed to be all the more more mature and sound design. The history of the MG 39 Rh begun in 1937. In that year the Heereswaffenamt (HWA, Land Forces’ Ordnance Office) having solved the GPMG issue with a temporary fix of MG 34 Frankenstein gun (combining organs donated by several contest entries bought-out by the Army), set about designing the machine gun of the future German Army, a kind of ‘Objective GPMG’, as it would be probably called today. In comparison to the MG 34, the future GPMG was to put up a higher rate of fire, be less complicated, more reliable, better suited to mass-production through the use of modern technology (e.g. sheet-metal stamping and spot-welding) to cut down machine time and skilled labor requirements. In February 1937 a tentative green light was given to the idea of sheet-metal stamped machine gun, and the HWA have sent requests for offer to three companies: Rheinmetall-Borsig’s filial in Sömmerda, Johanness Grossfuss in Döbeln, and Stübgen of Erfurt. Of these, the Sömmerda’s Rheimetall (part of the Borsig railway stock and machinery giant as of January 1936) was Germany’s prime machine gun clandestine designing center since 1918, doing most of the prohibited machinegun development by lieu of its Swiss filial – the Solothurn company, set up especially for that purpose. Its residing designing genius was no less than Louis Stange – the guy who gave Nazis the MG 15, MG 17, MG 34, MG 81, FG 42, MP 34(ö) and many other famous German automatic small arms. The companies were asked to design a machine gun basing on sheet-metal stamping technology, with tolerances looser than MG 34, with receiver spacious enough to accommodate debris and dust – but using as many MG 34 accessories as possible, including the Gurt 33 or 34 non-disintegrating link ammunition belts. Other than that – especially as to the future machine gun’s method of operation – the designers were given a free hand, providing their gun would work reliably with the standard German ammunition, the 7.9 x 57mm. The whole project was then still mostly an experiment, and the central funding available was a token one at best, therefore no finished weapons were required, just mock-ups. On October 26, 1937, Rheinmetall and Stübgen have both submitted gas-operated guns, while the Grossfuss gun was a short recoil-operated one. The Stübgen gun was canceled even at that early stage, while functional models were ordered of the Rheinmetall and Grossfuss entries, the latter openly favored by the military as the short-recoil design. In April 1938 Stange’s gas-gun had shot the living daylights out of the Grossfuss’s recoil-operated model, but once again the horror vacui spelled the doom for the Rheinmetall. Despite the disastrous results at the shooting range, the military have chosen the yet-imperfect recoil-operated gun. With lots of TLC from the HWA officials, the lame duck was soon rectified enough to morph into the WW2’s most feared machine gun and still, after 70 years, a mainstay of many armies all over the world including prime NATO countries like Germany, Turkey, Italy, Denmark or Norway – the MG 42. Despite the thumb down from the machine gun contest board, the company decided to go along with the design, which they deemed still promising – so much so as to fund the development from their own pocket. Rheinmetall, cooperating with Germany’s armies since 1899, had much experience in dealing with the military. They knew that in a pinch, the HWA would buy their gun, drilled bore or no drilled bore. Should the Grossfuss prototype fail, they would be waiting in the wings with a perfected model, ready to be introduced overnight. And should the Grossfuss prototype eventually win… well, at least they would die trying. We lack the records to confirm or deny that the perfected Rheinmetall gun was ordered for the 1939 Döberitz trials, which resulted in accepting the recoil-operated MG 39 from Grossfuss. The MG 39 Rh from Prague is serial numbered ‘006’, which tends to prove only that at least five others were made. Or some more, as there are also other serials on this gun. 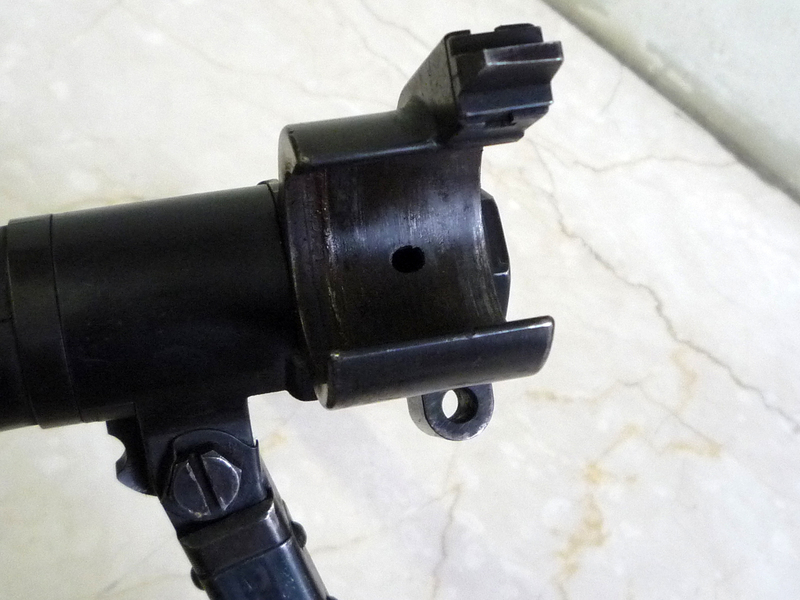 The bolt is electro-etched ‘09.’ (Germans frequently dotted 6 and 9 to avoid misreading – this gun proves this was not necessarily a fool-proof method, if you find a bolt for s/n 9 in a s/n 6 weapon…), while the buttplate has ‘29’ struck to it – both could indicate that more MG 39 Rhs were made: at least 3, but possibly as many as 23. The company took two patents for the gun, and both (DE 712 136 and DE 724 418) were signed on by Louis Stange. The quality of manufacture is very high, this is certainly not some workshop model, but a machine-manufactured, at least semi-serial produced weapon. Interestingly enough for every Nazi gun buff – there is NOT a single Waffenamt mark, anywhere, which clearly denotes that the MG 39 Rh has never been a military small arm. That the MG 39 Rh was preserved in Prague may be just a coincidence, but it has got very much in common with the Czech machine gun designing school, especially with Vaclav Holek’s masterpiece, the ZB-26, eventually developed into the magnificent Bren LMG. No doubt that the ZB-26 must have impressed Stange – but of course he was not a copyist but a great designer in his own right, so the influences are to be derived, not just pointed to. 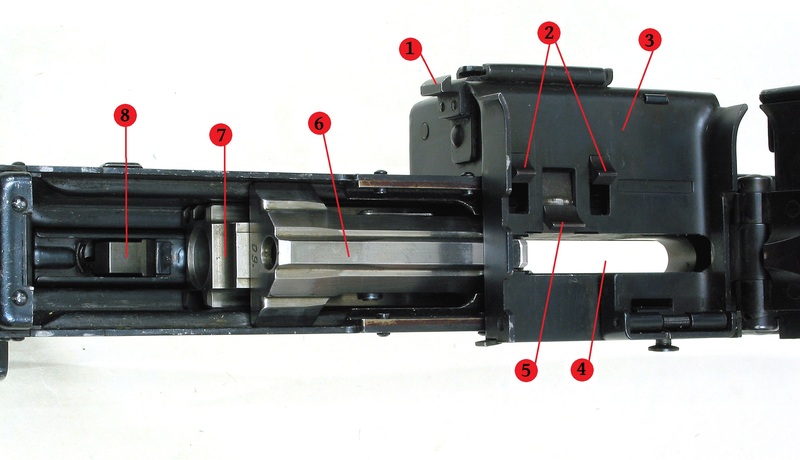 A look into the receiver with open feed cover: 1. projections for fastening of the ‘assault’ belt drum for 50 rd belt; 2. belt retaining pawls; 3. feed tray; 4. ejection port; 5. feed pawl; 6. bolt (in intermediate position to show sear); 7. bolt carrier; 8. sear (normally obscured by the return spring). All modern German small arms were locked by rotating bolt – but all of a sudden this gun has a tilting bolt locking, like ZB-26. The bolt carrier has bolt unlocking ramps, the firing pin is contained within the bolt and struck by a separate projection on the bolt carrier – again, like in ZB-26. The bolt is locked by tilting within receiver, but the locking abutment is not located in the upper rear part of the receiver, where the locking shoulder of the bolt is forced into by the ridge on top of the ZB-26 bolt carrier. Instead, in the MG 39 Rh, it is the front part of the bolt that tilts up for locking. In the last phase of the forward stroke by the bolt carrier, the bolt meets the barrel mounting block and stops there, but bolt carrier still moves forward, forcing the front part of the bolt to tilt up and locks it. This change was forced by the differences in receiver design. The ZB-26 receiver was machined, having plenty of strength to support locking. In the MG 39 Rh the receiver is made out of spot-welded and riveted sheet-metal stampings, and the only element stout enough to withstand the forces involved is the barrel mounting block, a machined core of the riveted and spot welded receiver. This is where the block is mounted, this is where the sight is mounted, and this is also a point, where locking abutments were placed within a small extension projecting rearwards. The locking lugs are lower points of (almost) triangular-sectioned bolt head, rising there while the bolt tilts, actuated by the bolt-carrier. Most of such designs are turn-bolt locked – why Herr Stange chose to involve that unnecessary complication of tilt-locking in a stamped receiver will forever remain a well-guarded secret. Bolt of the MG 39 Rh: 1. transport latch socket; 2. bolt locking lugs; 3. extractor; 4. case head stabilizer; 5. firing pin opening; 6. unlocking ramp; 7. firing post opening; 8. bolt guiding lugs. The firing is again accomplished in a manner very close to the ZB-26 – but not that of a Bren, where the front portion of the central unlocking post serves as a “hammer” to administer a blow on the firing pin. 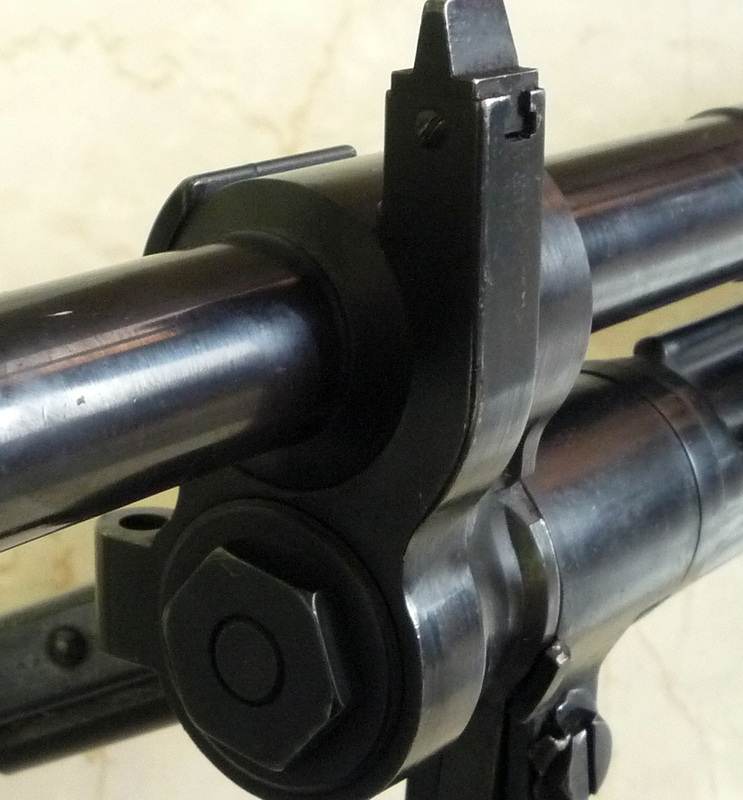 In MG 39 Rh, as in ZB-26, there is a separate firing projection at the rear of the bolt carrier – and octagonal in section of all available shapes. After the shot is fired, expanding gases pushing bullet down the bore reach the gas-opening and some of it is vented to the gas-chamber where it pushes the gas piston (and with it – the bolt carrier) back. 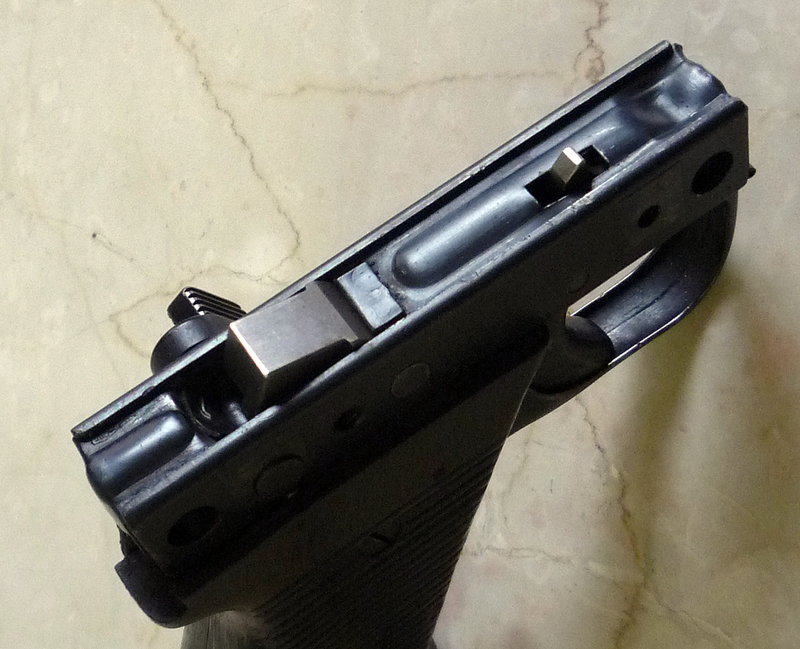 The bolt carrier slips from under the locked bolt, and the rear ramp of the unlocking projection mates with unlocking ramp cut into the bolt and start to tilt it down, to unlock. When the unlocked recoiling parts start their rearward stroke, the transport lock lever on the right side of the bolt carrier mates with a channel in the receiver wall and rotates, latching the bolt with the other arm. From that point on the bolt is rigidly locked with the bolt carrier and remains so for the duration of the recoiling parts reciprocation. It is not until another shooting cycle is started (this is an open-bolt design) and the bolt strips another cartridge from the belt that the bolt is again free to tilt after the locking lever exits the receiver channel again. The belt is fed from the left side of the feed tray, exactly like in all other German machine guns. The belt itself was also a standard wire-bound open-bottom non-disintegrating links ‘direct-feed’ Gurt 33 or 34. The bolt however had not the common spring-loaded extractor, but a Browning-style rigid gutter cut into the bolt face. What’s even more surprising, given the shape of the claws and the tilting motion of the bolt, it is obvious that the cartridge rim is NOT held in it during the firing. It is only at the beginning of the unlocking, when the bolt dips from the locked position, when the claws enter the groove! And the grip was not a very tight one, necessitating addition of the special spring-loaded rim stabilizer, supporting the upper part of the case head during extraction in order not to allow the case slip out too early. Again – why such an experienced designer went to such frivolity would probably never be known. It is possible though, that the normal spring-loaded extractor would not fare better, giving the magnitude of the front-oscillating movement of the tilting bolt design – after all the ZB-26 was a rear-tilter and breech face made only minimal movement. If the extractor seems unusually complicated, the ejector was as far from mundane and boring. It was an oscillating or ‘see-saw’ type if you like, shaped not unlike a cavalry spur. It has two arced members straddling the bolt, with ejector plunger projecting downward from the junction of the said members. It was suspended with two separate pivot-pins, one each side of the receiver cover, supported by its own operating springs and operated by the reciprocating bolt. Close to the point of rearmost recoil the bolt hit the sloping rear ends of the ejector, violently dipping the front end, with ejector plunger striking the case body like a guillotine and throwing it out of extractor claws through the bolt carrier ejection port into the ejection opening on the bottom of the receiver. 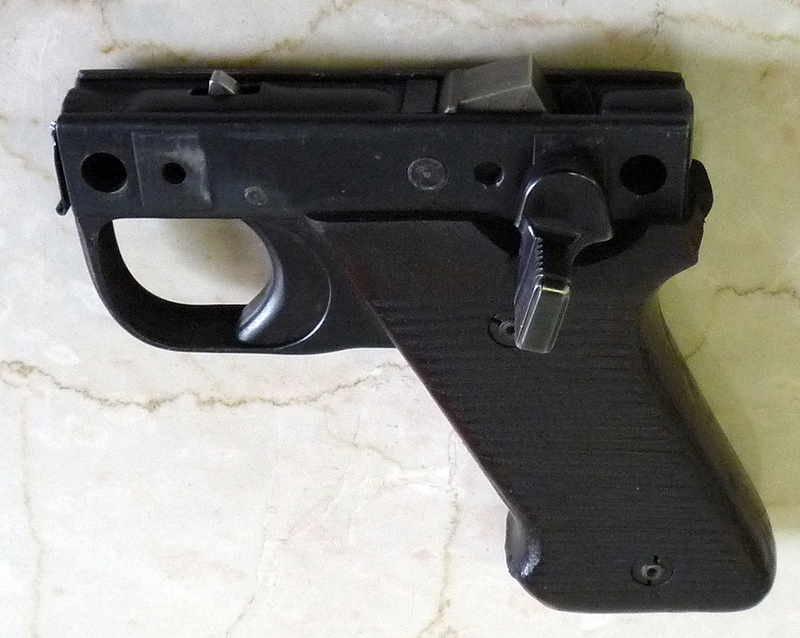 Today, lever-type ejectors are quite common in retarded blowback guns, like Swiss StG57 (SIG510) or the HK series – but usually WAY simpler in manufacture, one piece levers. Inside view of the MG 39 Rh feed cover: 1. cover latch; 2. ejector pivoting projections; 3. ejector spring; 4. ejector pivot; 5. ejector plunger; 6. pressure plate. The recoiling unit’s weight was mere 790 gram – which is really not much: some of the blowback sub machine guns had bolts weighing in at similar level. It consisted of bolt carrier with a long-stroke articulated gas piston and tilting bolt. The bolt carrier governs the functioning of all other machine gun mechanisms. 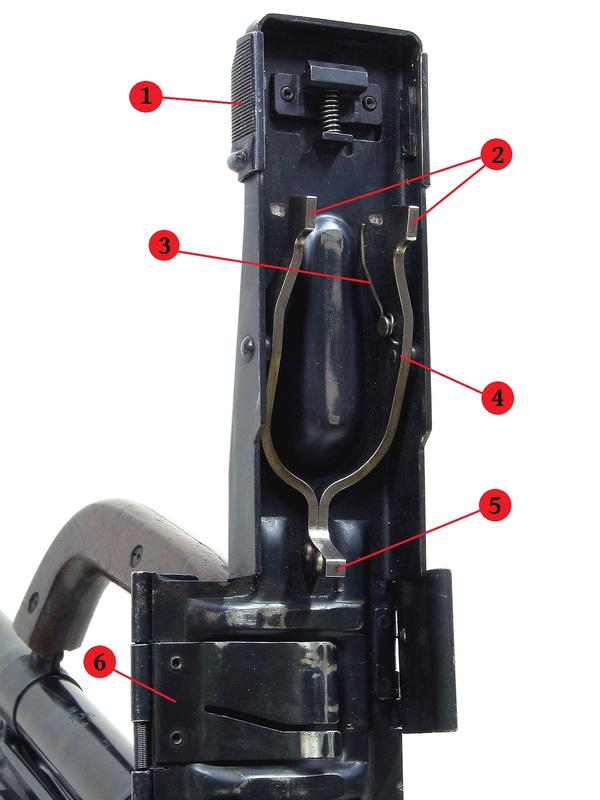 There is a locking/unlocking projection there, as well as the bolt transport lock, the belt-feed lever cam path, sear notch and safety sear notch (tripping the sear in case of insufficient recoil), as well as a firing post (to inflict a blow upon firing pin on forward stoke) and ejection window. Bolt and bolt carrier with bolt unlocked (left) and locked (right): 1. bolt carrier; 2. bolt carrier locking ramp; 3. bolt locking lug; 4. bolt unlocking ramp mated with bolt carrier unlocking projection; 5. firing pin retainer clip; 6. feed-lever cam path. Unfortunately, the surviving specimen is incomplete, so one can’t tell how the bolt cocking lever was shaped (and even positioned) like. The only thing that left is a long bottom slot, a rear portion of which serves as an ejection opening, closed by a sliding cover with a spring-loaded retainer, released by the recoiling bolt-carrier, exactly in the manner of the ZB-26, ensuring automatic opening at latest by the first shot fired. 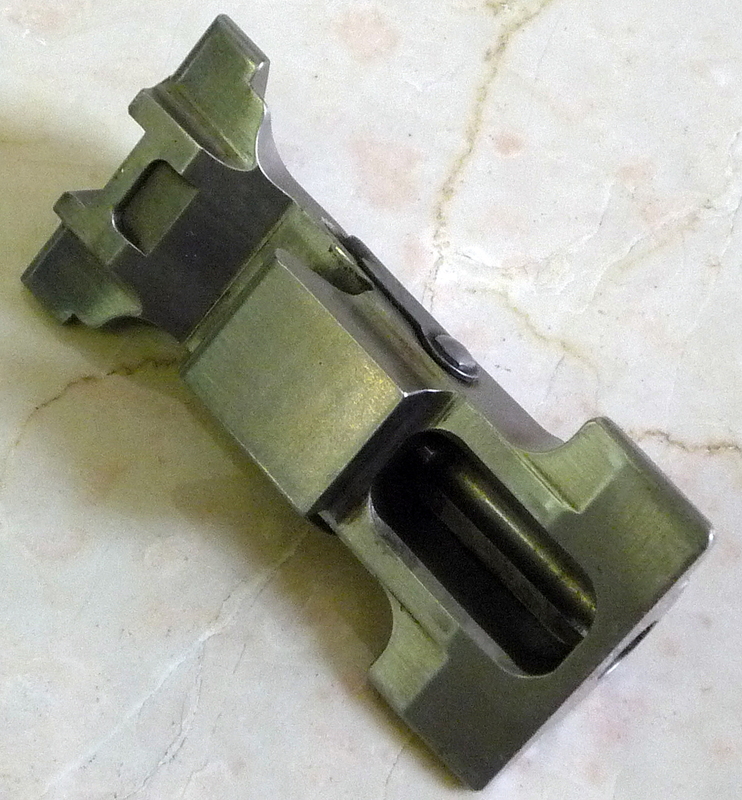 Bolt carrier: 1. bolt-carrier guide ribs; 2. firing post; 3. bolt’s transfer lock; 4. ejection chute; 5. gas piston swivel; 6. bolt’s travel lock lever. By far the most atypical part of the MG 39 Rh is the firing pin, the cross-section of which resembles the three-pronged Mercedes star, covered by patent DE 724 418. This was surely done in order to strengthen the firing pin – but was it worth the complication of cutting Y-shaped firing pin opening in the breech-face? The patent description clearly states the reason for that complication – if the conventional round-sectioned firing pin stuck in the breech-face, violent movements of the front-tilting bolt – combined with guillotine action of the ejector – usually snapped it off like a match stick. The most common cause of the stuck firing pin was primer perforation. By changing the shape of the firing pin, it was possible to increase the area of the firing pin indentation, which had a three-fold advantage: first, the increased area of the blow distributed the force more equally to reduce the chance of perforation and sticking of the pin. Even if the primer was pierced, the hole was too small to enter a portion of the pin significant enough to stick. Secondly – the larger the area of the blow, the better the chance to ignite the primer, should for some reason the firing pin strike off-center. The third advantage was the large diameter of the firing pin, increasing the service life and breaking resistance. Another unusual (for that era, at least) mechanism was the belt-feed. In stark contrast with his own previous MG 34 where everything connected with belt transfer was kept under the lid (i.e. 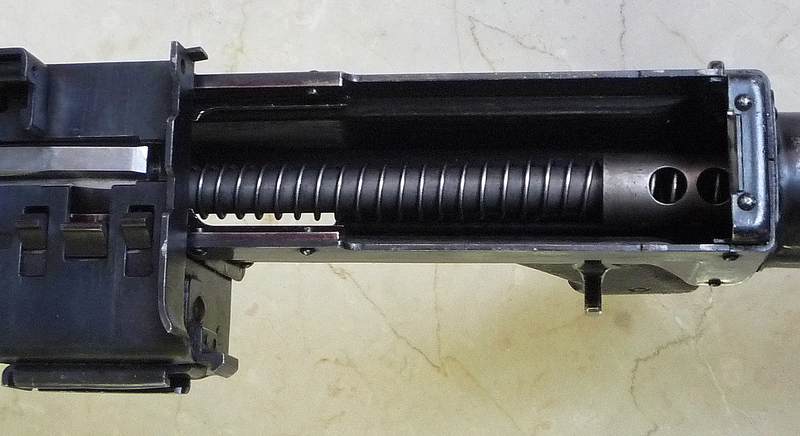 feed cover), the belt-feed mechanism of the MG 39 Rh is contained entirely inside the receiver. With an ejector like the one he already planted up there, he had no other choice, anyway. 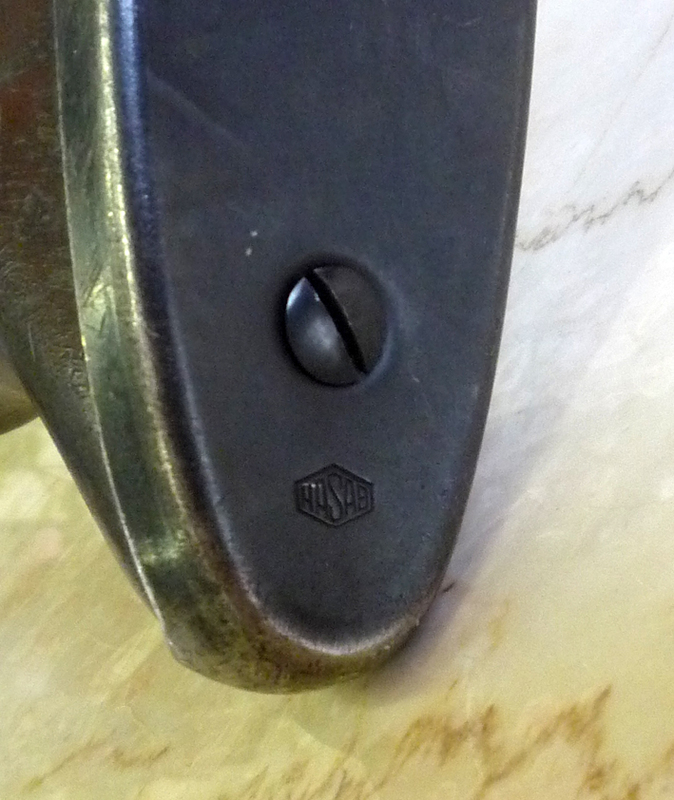 The belt-feed lever is an L-shaped one, pivoted at the junction of the prongs. The lower prong culminates in a roller, traveling within the cam path along the left side of the bolt-carrier. As the receiver reciprocates, the flattened ‘S’-shaped cam makes the upper arm of the lever oscillating back and forth in a plane perpendicular to the bore axis. On top of that lever a spring-loaded pivoting feed-pawl is placed. 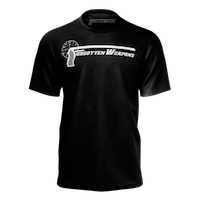 As the bolt-carrier recoils, the cam paths forces the lower arm down, causing the upper arm to move right (inwards) and the feed pawl drags the belt by one link, centering the fresh cartridge on the feed path. As the cartridge transfer is complete, belt retainer pawls forced down by the sliding case snap up again to keep it from falling back, and a two-pronged cartridge pressure plate placed inside the feed cover forces it down the feed slot, into the bolt path. The cartridge pressure plate is not spring-loaded – it is stamped out of a leaf-spring steel and riveted into the feed cover. As the bolt-carrier counter-recoils, or is released from the sear by the trigger, the cam-path along the carrier forces the upper lever outwards. The feed pawl on top of it is pivoted and spring-loaded, so on the outward stroke it folds out of the way while pressed against the fresh cartridge in the feed way, and snaps back behind the next cartridge. The whole of the belt feed mechanism is encased inside the receiver projection on the left side of the gun. The MG 39 Rh has a quick-change barrel, enabling rapid exchange when heated. 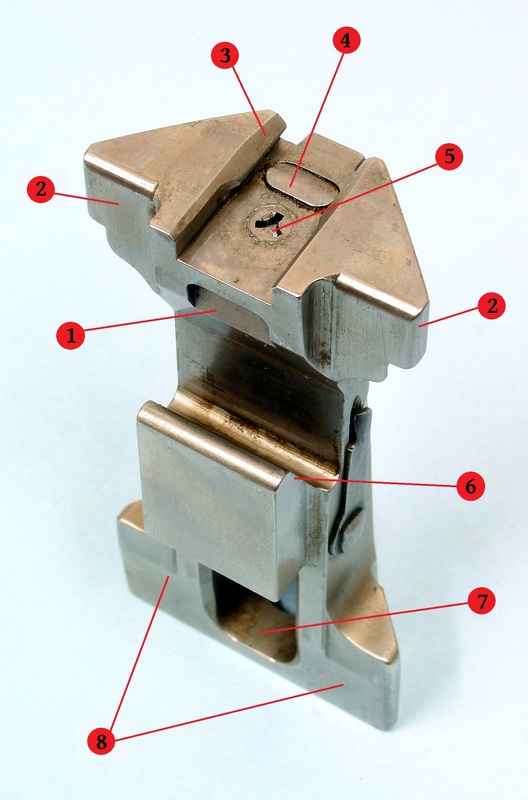 The barrel latch, as in most other QCB designs of the era – again including the ZB-26 – was using the interrupted thread principle. The difference is, that in German machine gun one has to insert and rotate the entire barrel (! 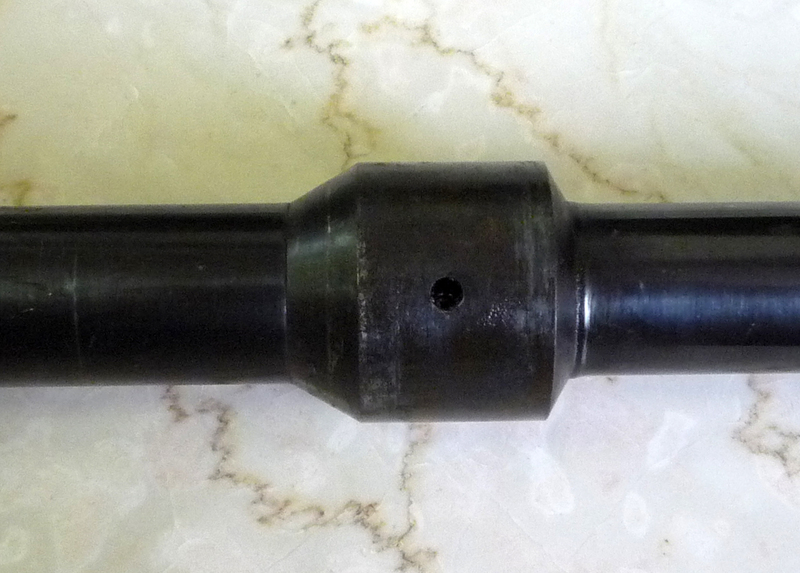 ), while in Czech design it’s only the barrel retaining nut that the gunner had to rotate upon insertion of the spare. This overly and unnecessarily complicated the design, forcing to thread the barrel socket in the barrel mounting block. It also tends to complicate the gas chamber design a great deal. In ZB-26 and all other gas-operated machine guns, the gas chamber is pinned to the barrel and impaled on top or inserted into the gas-tube. It is a simple, time-honored solution – alas, the barrel has to be fastened by some kind of a bayonet joint to remain strictly in-line at all times during the change. In MG 39 Rh the price of the originality was the ‘insert-then-turn’ barrel change, resulting in an inherently leaky gas chamber. Of course, the machine gun gas chamber is not a bathroom heater and it would never be gas-tight – the entire purpose is to bleed the gas off after it is used to propel the piston – but the operating phrase there is ‘after’… In MG 39 Rh much of the gas is leaked out serving no purpose whatsoever. Barrel change under way: note the vertical barrel retainer lever and barrel’s interrupted threads. Note also fatigue crack of the rear barrel handle joint. The changing of the red-hot and swollen barrel that has to be twisted-off (if only by three dozen degrees) spawns more troubles still. The weapon has to have a change handle stout enough to withstand repeated banging on it in order to rotate the swollen barrel – and at the same time temperature insulated to save the gunner’s hand from blistering heat. In MG 39 Rh the barrel handle is a C-shaped affair, very stout, made of two stamped steel halves riveted, and fitted with a wooden handle. The whole affair looks almost like the AR-10 carry handle, and would it be placed closer to the point of balance, it could serve as a carry handle for the whole machine gun, as the barrel itself wouldn’t rotate out of engagement, being held by a spring-loaded latch on the right. The rotating barrel and lack of gas-chamber rigidly placed on it, although can be now held as a predecessor of the ‘free-floating’ barrels we do worship today, had another drawback – the sights placement was unusual to say the least. Although there were no magazine well on top of the gun, it still had the sights offset to the left – again, after the ZB-26 fashion! 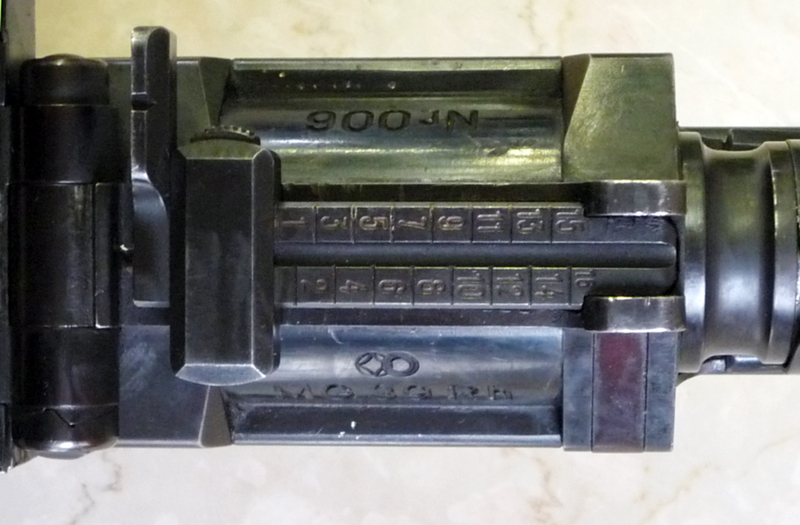 The leaf rear sight was centered on top of the barrel mounting block and quite conventional – except that the actual sighting notch was placed in a long holder offset to the left. The front sight was also quite conventional in appearance – but placed on the left side of the wide U-shaped barrel opening of the gas chamber, permanently fixed to the gas tube. Gas chamber barrel-bed with gas opening matching the one drilled in the barrel – note the asymmetrical front sight base. ‘Barrel bushing’ with a gas opening mating with the one in the gas chamber. Stange’s MG 39 Rh might have been lost for decades, but that doesn’t mean its design features were left to rot on the vine. The pivoted joint of gas piston with bolt carrier at once resembles that of the PK/PKM series, an impression further strengthened by the comparison of their belt feed mechanisms. But the PK/PKM belt-feed, although showing a surprising number of common points, is somewhat different – the belt stops were moved to the feed cover, and the L-shaped feed lever is governed by the bumps along the bottom of the bolt carrier, and not the cam-path in its side. Looking for a complete copy of the Stange’s belt feed, one should compare it with another Warsaw Pact GPMG – quite curiously, the Czech UK vz.59. Gas block with a gas regulator (hexagonal nut) and front sight base. Upper gas tube with stamped barrel guide and side-projecting mount trunnions. The Hugo Schneider AG (HASAG) metal goods factory’s civilian logo impressed at the buttplate. The HASAG was best known as the ammunition manufacturer, using codes ‘aux’ and ‘auy’ during the war, as well as the birthplace of the first ever fielded recoilless shoulder-fired AT weapon, the Panzerfaust. Insides of the receiver with return spring in position. Note the floating spring rod inside. 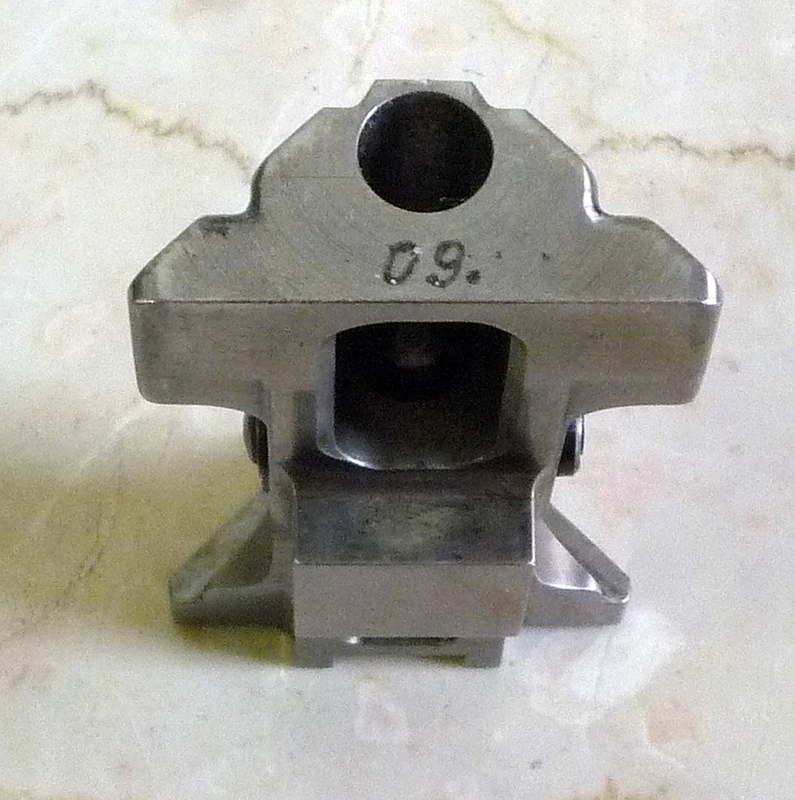 MG 39 Rh rear sight leaf – note the asymmetrical notch carrier offset to the left, even though the rear sight itself is perfectly centered atop the barrel mounting block. Trigger group detached from the receiver – note similarity of design to other German machine gun trigger groups of the era: MG 34, MG 42 and FG 42. Note also the large safety lever, blocking the sear. Top view of the trigger group with protruding sear (rear) and disconnector (front). 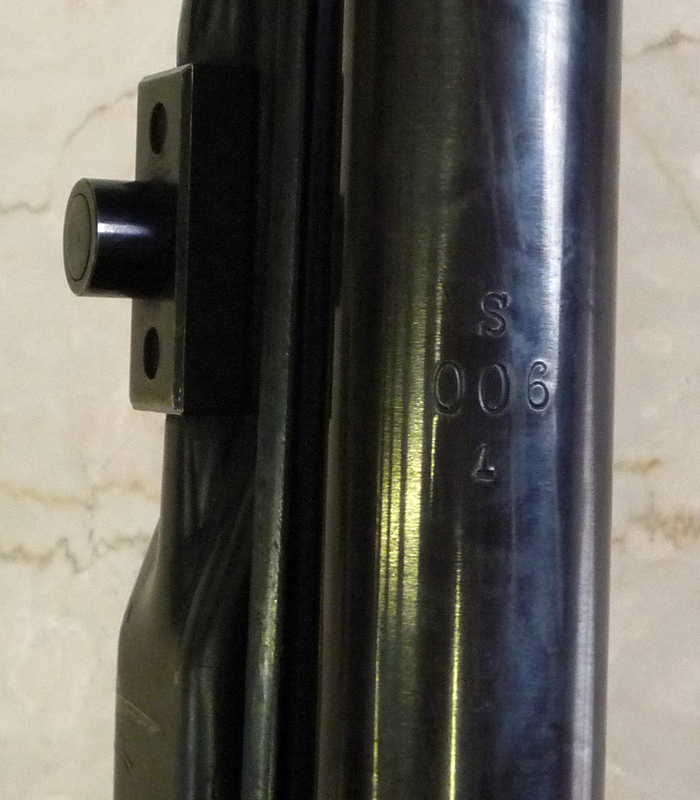 Barrel legend ‘S/006/1’ contains: ‘S’ for ‘Sömmerda’, ‘006’ as gun serial number and ‘1’ for No.1 barrel. That’s a seriously awesome post and technical breakdown. Kudos! It’s worth noting that the German concerns over drilling ports in the barrel were not entirely unjustified. Gas operated weapons of the early 20th century tended to have poor erosion qualities near the gas port, which would reduce reliability of the mechanism, even leading to out of battery firing in some cases. What solved this problem was chrome lining or stainless steel gas fixtures (as in the case of the US Garand rifle). Terrific article! I wonder whether the oddball extractor design doomed this design in the HWA’s eyes. The Eastern Front veterans all commented on stuck cartridge cases being the single most common functioning problem with the MG.34 and MG.42. The corrosive ammunition resulted in chamber pitting which steel cartridge cases were very sensitive to. A most excellent article indeed. Is anything known about the rate of fire, apart from the higher than MG34 requirement? Lamentably, no performance data are known, and the Prague’s gun is in unshootable condition. Hopefully some records of the testing will turn up at some point. The Germans kept meticulous records, after all. MG81 is very rare type of all machine guns and final evolution of MG34,Germans was in need of machine gun thats will not recquired barrel changes but have a significant rate of firepower and this rate reaching 1800 rounds per minute…. At first model or model G was builded by utilising milling process but later models such F or E had sheetmetall stamping fabrication with spot welding which Germans are best known for it….. Curiously but fact MP40,STG44,MG42,Garet 03,FG42 was utilised sheetmetall stampings which reduced machining process,working hours,costs and decreased time of production line…. Many probably know now thats FG42 evolved in M60 machine gun…. Thanks for pointing out the missing MG13 machine gun from the Stange’s corner in the Nazi Machinegun Designers Hall of Fame. And you’re right about MG81 – this was a Mauser design, my bad. 1. WW2 Luftwaffe’s MG 15 (T6-220), as well as the same service’s MG 17 (T6-200) were in fact Rheinmetall weapons designed by Stange, derivatives of his S2-200 light machine gun (the Austrian Army’s LMG M.30 and Hungarian Army’s 31M. Geppuska). 2. Bergmann lMG 15 n.A. was quite another weapon, but also a Rheinmetall design from WW1. BTW, Stange was an apprentice designer by that time but he still managed to stick his fingers in this pie as well: even though the lock for the MG 15 n.A. was designed by Louis Schmeisser (father of MP18.I designer, Hugo Schmeisser), it was Stange who designed the rest after his co-designer died. 3. MP34(oe)was another Stange/Rheinmetall design, once known as MP20Rh, then MARKETED by Solothurn (Swiss filial of the Rheinmetall) and MANUFACTURED by Steyr, both for export (as the Steyr-Solothurn S1-100) and for Austrian Army as MPi M.34, later to become the MP34(oe) of the Nazi army. 4. The early FG42 models and prototypes were milled, but only because the cost of making the VERY expensive sheet metal pressing dies was prohibitive. The gun was designed to have a sheet-metal receiver right from the start, and as soon as any sizeable production was launched for troop testing, the dies were made and sheet metal FG-42s (to include even sheet-metal formed buttstocks) were manufactured. You have to bear in mind, that although the sheet-metal stampings might be “a dime a dozen”, the equipment to make them is quite the opposite (dies and presses), and even Nazis were not immune to economy. 5. No doubt that FG 42 had its own unique story – could you point to a quote that I wrote about 39Rh being entwined with it? Far from it, I wrote in plain (I thought) language that it had nothing in common. 6. FG 42 never “evolved” in M60, although there was a machinegun called T44, actually an FG-42 with MG-42 belt feed mechanism slapped to it vertically on the side. After 30-06 gave way to the 7,62×51, this morphed into a completely new machine gun, the T52, combining Lewis-style bolt/op-rod and MG-42 feed now placed horizontally – and it was that latter machinegun which become a predecessor of the M60. “FG42 evolved in M60” is much too much of a poetical license – you might as well written that it was the Lewis that evolved in M60. A great in-depth article with contributions from very knowledgeable writers, differences of opinion notwithstanding:). Ian — are you and the “gang” still planning on traveling to Europe ( specifically, Eastern Europe ) for more firearms factory and museum tours in 2013? Please let me know accordingly. Ian, if you plan to include Central Europe (Poland, Czech Republic) in your tour, let me know as well – I can arrange you some interesting things to see. Many thanks for such a well researched piece, on such an unusual gun. The Germans’ prejudice against drilling the barrel for a gas port has another point to it besides the problems with corrosion. In tests conducted by Hiram Maxim, he found that the most accurate gun was one in which the barrel is recoiling. In the gas operated prototypes that he built, he found that although they worked reliably, they were not as accurate as the recoil design. I can’t imagine how difficult it must have been to machine the barrel threads in a way that allowed the gas hole in the barrel to line up with the hole in the gas tube.